A new national survey of Latino voters shows Democratic presidential candidate Barack Obama with a nearly 3-to-1 advantage over his rival, Republican John McCain. The survey found that 60 percent of Latinos planned to vote for Obama, compared to 23 percent for McCain, while 16 percent were undecided. Latino Decisions, a collaboration between Pacific Market Research and University of Washington political scientists Matt Barreto and Gary Segura, conducted the poll by telephone June 1–12. 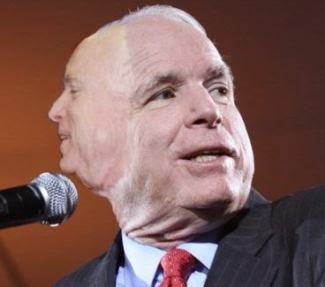 If McCain has any enduring principles on immigration at this juncture, they’re impossible to discern. Actually, they’re not entirely indiscernible. John McCain’s one enduring principle, across a whole range of issues, is Whatever Benefits John McCain. If that’s his political compass, well, no wonder he talks out both sides of his head.